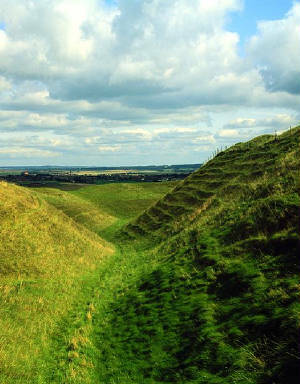 Maiden Castle hill-fort, Winterborne Monkton, near Dorchester in Dorset. Its ramparts enclose an area of 18 hectares (45 acres), and it is 2.5km (1.5mi) around the inner circumference. 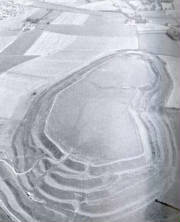 The early construction of Maiden Castle took place around 3000 BC. In the late Neolithic period a massive long barrow, over 545m (1788ft) in length, was constructed. 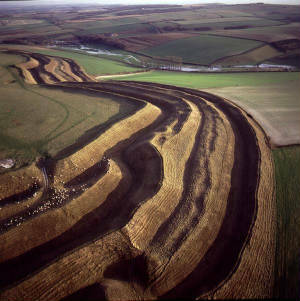 About 450 BC the hillfort was extended westwards and by the third century BC ramparts and ditches were enlarged, with two complex entrances at the east and at the west of the hill.